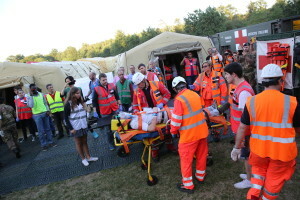 On May 27t the SocioPatterns platform was deployed to track and analyze the interactions of people, objects and spaces during a full-scale exercise organized by the CRIMEDIM Research Center in Emergency and Disaster Medicine in collaboration with the Italian Army and a number of other partners, including the ISI Foundation. The exercise involved almost 500 people, a ROLE2+ military field hospital, 2 primary care centers, 8 ambulances and a coordination center. The tracking system featured fully-distributed recording of the interactions between people, ambulances, hospital rooms and equipment, with real-time monitoring of the hospital workflow and live views in the operations center.